Tanks and pots are used to provide a pressured feed of adhesives, UV cure, lubricants, glues, oils, liquids and fluids direct to dispense valves. 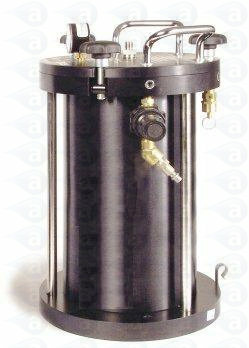 All tanks are CE certified and supplied with fluid lines, fittings and connectors. 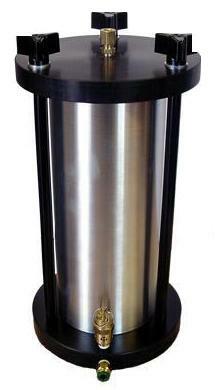 Use these pots for providing a controlled feed of liquids without mess or material waste. Select from a range of tank sizes and options. 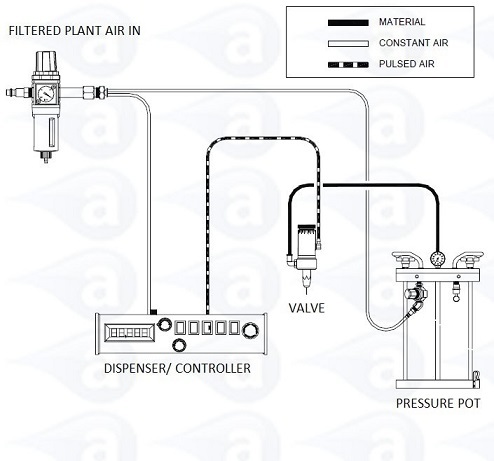 Pressure pots and tanks for controlled feeding of most low to medium viscosity fluids to dosing valves. In sizes of 0.5 to 19 litres. Each CE certified tank system is safe for use with industrial applications and includes a connector outlet for use with plastic feed tubing and luer lock fluid lines. For dispensing very high viscosity pastes and sealants, please contact us for information on high pressure pump systems. Use cartridge reservoirs as a useful method of feeding watery liquids to high viscosity pastes, sealants, gels, silicones and greases to a metering valve. Cartridge sizes from 2.5oz (60cc/ml) to 32oz (960cc/ml). Prices are in UK pounds. Vat is not charged on orders placed outside the EU and any EU orders are exempt from VAT only if a valid company VAT number is provided to us at time of order or before shipping. Products are covered by a 12-month warranty against faults and malfunction. All orders online are encrypted for safety and security. Please read our privacy agreement for details. We also process phone or fax payments by credit and debit card. Please contact our accounts department if you would like to open a credit account with us. Our new web shop is available to order these products in a number of different currencies. Please visit www.adhesivedispensing.co.uk for more details. Disclaimer: While reasonable efforts have been made to ensure all information on this website is accurate, Adhesive Dispensing Ltd. do not assume responsibility for any errors or omissions. All specifications, illustrations, data and prices are subject to change without notice. Copyright 2005 - 2017 Adhesive Dispensing Ltd. All rights reserved. Items are shipped in the UK by a courier on a next day tracked and insured service for all items that are available from stock. Items on a lead time will be shipped as soon as they are available. All tanks are robust and suited to industrial use. These products are not for medical applications but are precision manufactured for industrial use. All tanks are covered by a 1 Year manufacturers warranty against fault.